(Newser) – "The bad guys, I hate to say it, are smart," a former DEA agent tells the Wall Street Journal. 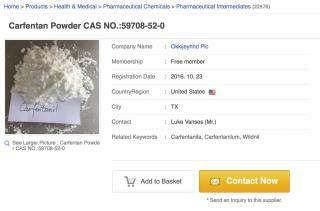 "They always seem to be a step ahead of the regulators.” The UN estimates that chemical labs around the world are cranking out "new psychoactive substances" weekly, so fast the DEA and other law enforcement agencies can't keep up. The Journal takes a deep look at one of those substances, a synthetic opioid called U-47700, that caused 125 fatal overdoses—at least—in the first nine months of 2016. U-47700 was created by a US pharmaceutical company in the 1970s while searching for the "Holy Grail," a painkiller as strong as morphine but without the risk. It was abandoned after tests on mice showed it caused dependence. If in search of the Holy Grail the best is at Netflix, Fate Stay the Night Unlimited Blade Works. If in search for it in drugs that Sodium Penathol is a nice trip before they jerk out your wisdom teeth. Not enough given I guess, waking up and the doc in there breaking up bone or teeth or something? Now on the way off to la la land his daughter-assistant dress seemed to be riding up higher and higher and of course me whacked out of my mind aint no telling what I said or did. Next election when I bring about the Fuhress better check to make sure the doc has nothing too incrimping on me or his daughter? Just means I have to get rid of them or anybody bringing it up! Enjoy voting today! The search for brains in the DEA has been going on for many years without success. Oh, well. If T(rump) gets elected, perhaps his handler Putin will replace the DEA with Chinese Commies.